much love, illy: GIVEAWAY + interview with Meghan from the Meg Shop!!! GIVEAWAY + interview with Meghan from the Meg Shop!!! I grew up in a very small town boasting the world's largest mallard duck. I drink cold peppermint tea almost everyday. I am addicted to Lush bath bombs. where do you get inspiration for your gorgeous pieces? I think a lot of times my inspiration comes from color. I just get stuck on a color and everything I make will be that color. I'm really into turquoise and red right now. If you could create a piece of jewelry for any person in the world, who would it be and why? and what would you create for him/ her? Tough question! I'm gonna go with Natalie Portman. She always looks so stylish and sophisticated. 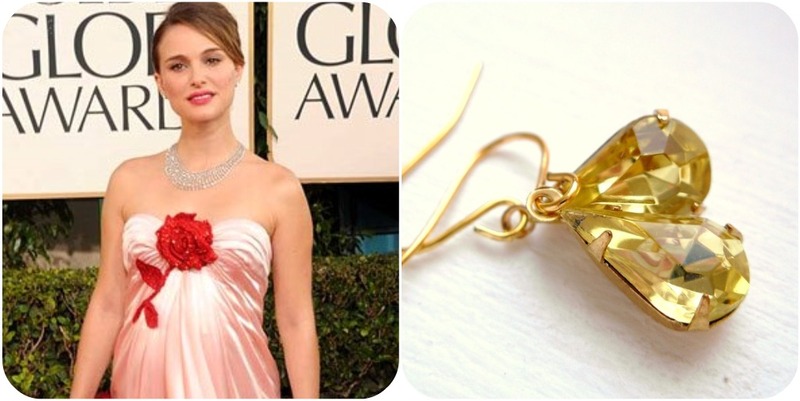 I would put her in something like my Lemon Drop Vintage Glass earrings. now check out this pretty lady's talent. and here are my particularly favorite pieces. are not the designs exquisite and the colors eye-popping? come back to life 'cause guess what, folks?! um, hello?! is that not incredible?! Giveaway is open to US and International readers until midnight, Sunday, February 13th. Her turquoise coin lariat necklace has been on my Etsy favorites since the beginning of time. Okay, not quite that long, but for a long time. I love it! her shop is full of soo much loveliness!! i LOVE the Moss and Silver . Tear Drop Hoops, so pretty!! I love the turquoise coin sterling silver earrings! I love her Circle swirl adjustable silver ring!I love that it's so simple! They're simple and chic and would look great with so many outfits. just "like" the meg shop facebook fan page!! Just "heart" the meg shop on etsy! The Innocent and Sapphire Trinity necklaces! Such clean lines and - yes - vibrant color...mmm. "Liked" The Meghan Shop on facebook! And hearted her on Etsy! one of the stacking bangles would be my fav. i can't decide which one! I love the autumn pumpkin earrings with the gold leaf...so cute and natural looking. I added her etsy shop to my faves! OH I love the Silver Smoke . Vintage Glass . Stacking Bangle!!! I love cream pearl and ribbon necklace!! Her stuff is so cute!! I love the silver pearl necklace! I love the sparkle leaf necklace! Following your blog :) Love it! *heart* The Meghan Shop on etsy!! Well it was next to impossible to just pick one but I think my favorite is the pair of Copper Cream Flower Earrings. Love all the jewelry! Thanks for a marvelous giveaway! Love the Sparrow & Sparkle stacking bangles - I definitely could use some new bracelets! Oh I just LOVE the english rose earrings! She has got some great stuff! I LOVE the Jet Black filagree star bangle - so classy! I like her shop on facebook! Wow, so hard to pick one fav, but for now really liking on those lemon drops vintage glass earrings. God has definitley blessed her w/an awesome talent. If I was on FB and twitter I would def follow, like, and tweet about her shop. I love the silver wave stacking bangles! I'm a follower and I like the light sapphire bracelet! It's so pretty! I liked Megan on FB! I follow! I love the silver wave set of 3 stacking bangles! i want those lemon drop earrings!!!! i heart-ed megan's shop on etsy! i'm a follower & i like the Sparrow and Sparkle . Set of 2 . Stacking Bangles! What pretties! I love her Silver Wave Stacking Bangle. Beautiful! My most favorite item (if I have to pick just one) has got to be the Sparrow and Sparkle stacking bangles! I love Meghan jewelry; That's a long time that she is in my favorites! What a fabulous interview and giveaway! Her shop is beautiful. I think the pumpkin glass bangle would have to be a favorite! I love the boho blue earrings! I follow your lovely blog and my favorite item is the grey skies pendant. I like the Meg Shop on Facebook. I heart the Meg shop on etsy. p.s. I've added The Meg Shop to my Etsy faves! wow love those earrings! and i have to agree with nat port too. love her! Love the turguoise coin lariat! I follow your blog with Google reader, and I adore the gilded peacock earrings! Too pretty! I love love love the amethyst bangle! I'm a follower & I love her Turquoise Coin Lariat! Ooh, and the gilded peacock gold earrings!! I hearted The MegShop on etsy! My favorite is the Filigree flower puff stacking bangle! The Burgundy and Black Flower Earrings are absolutely adorable! I would love to have those! i love the Sparkle Leaf Stacking Bangle Set!!! it's so pretty! Filigree Flower Puff Stacking Bangle! anddd i liked her shop on facebook! <3 her etsy store as well! I love you Frosty Leaf Stacking Bangle Set! :) and your blog! went on etsy and <3'ed it too! I love the light sapphire blue memory wire bracelet! The color is just gorgeous and this would work with a lot things I have! I like the Meg Shop on Facebook! I hearted the Meg Shop on Etsy! P.S. The hyperlink where it says "heart The Meg shop" takes you to her facebook page. I'm a follower (happily) and I'm digging the turquoise coin pendant! love the gold peacock earrings! I just LOVE the pearl and silver stacking bangle!